Italian bakery manufacturer, San Giorgio Dolce & Salato, now relies on a fully automated system from Schubert. San Giorgio Dolce & Salato was the first manufacturer to introduce pre-baked, filled and frozen croissants to the gastronomic market. To succeed with this product innovation, the company needed a system that could gently inject different fillings into the baked goods and efficiently combine this operation with the final packaging process. A system developed by Gerhard Schubert GmbH for the new Italian customer is ideally suited to this challenging task. Long before coffee-to-go became en vogue in the rest of the world, the working day in Italy always started off with a visit to the local bar for a fortifying morning cappuccino and croissant. Consequently, a study published by Agrifoodmonitor found that away-from-home consumption currently represents one third of total F&B consumption in Italy. In the decade 2005-2015, the value of food consumption increased overall by 13 percent to 230 billion Euro, a growth that is mainly related to away-from-home consumption (+ 30 percent), which amounts to a value of 130 billion Euro. Even in Italy, people are in more of a hurry these days. Baristas often serve deep-frozen croissants and other pastries that then simply heated up in the oven. This allows them to offer their customers an extensive selection of oven-fresh baked goods. In its GAIN Report, the American USDA (United States Department of Agriculture) stated that changing Italian lifestyles have given a boost to the food service industry. Italy is thus moving towards trends and lifestyles seen in other European countries, and it is forecast that an increasing number of consumers will eat out during their breaks. In order to combine good taste with the fast pace of modern life, San Giorgio Dolce & Salato was the first manufacturer to develop pre-baked pastries and bring them to the Italian gastronomic market. The pre-baked dough pieces are handy for the baristas, who can quickly bake the frozen croissants and serve them to their customers. They not only save considerable time in preparation, but also benefit from a very high-quality product with great taste. 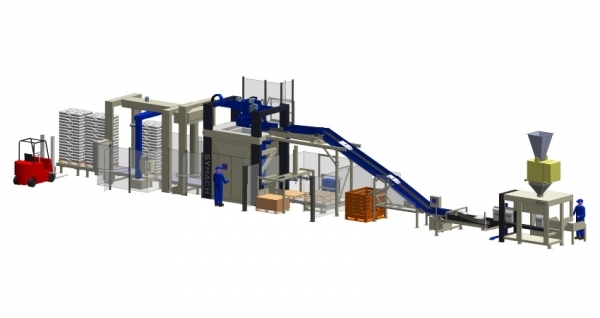 A new, fully automated system, which could efficiently fill and package the baked goods while handling the products extremely gently, was necessary to bring the innovation to the food market. At the Ipack-Ima 2015 trade fair, San Giorgio Dolce & Salato looked into possible technologies and became aware of the Schubert company and its products. During the bidding phase, the packaging specialist impressed the Italian manufacturer with its professional project support. Right from the beginning, the Schubert experts focused on the product’s special features. One challenge was to integrate an injection station from machine manufacturer, Canol, into the system’s design. With this in mind, Schubert’s Sales and Project Manager, Antonino Lanza, worked closely with Canol. The result is an injector that is precisely matched to Schubert’s robot-based technology. Additionally, the customer was impressed with the gentle, safe gripping technology and the characteristic flexibility of Schubert machines. This makes it possible for the machine to inject different fillings into the croissants as well as other baked goods. In addition to the technological benefits, the trusting collaboration that was in place from the start—between two family businesses—was also important to the customer. The system that Schubert developed for the customer consists of four sub-machines. 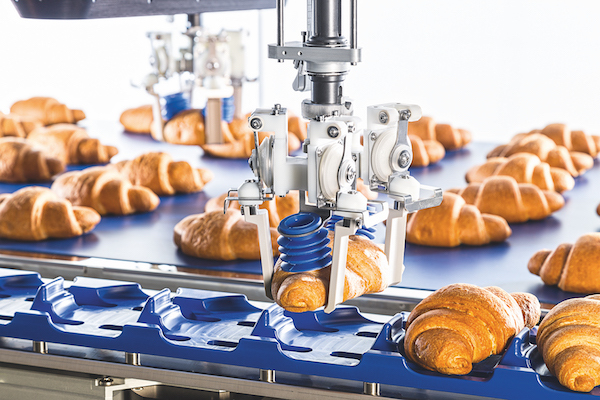 Within the system, three pick-and-place robots and two F2 robots take over the handling of the croissants. This begins immediately after baking: the baked goods are moved from the oven to the first machine for pre-grouping. There, a 2D image recognition system first checks the position of the products and transmits the data to the F4 robots at the next station. Controlled by two servomotors, these can execute any movements in a two-dimensional working field. Since the croissants are delicate baked goods and vary in height, density and consistency, the robot needs to handle them carefully. This is ensured by four grippers and flexible damping on the robot tools, which do not dent or damage the soft and still warm products. The picker arms grasp the croissants one at a time and place them on the Transmoduls in 12 rows with even spacing. These transport robots bring the croissants to the injection station, where a component fills them with jam, chocolate or vanilla cream. A robot positions the croissants, and the component with 12 injection needles approaches and punctures the croissants. Flexibility is required here as well: the needles are adjustable in height, and it is also possible to determine how deep they need to inject the filling into the baked goods. 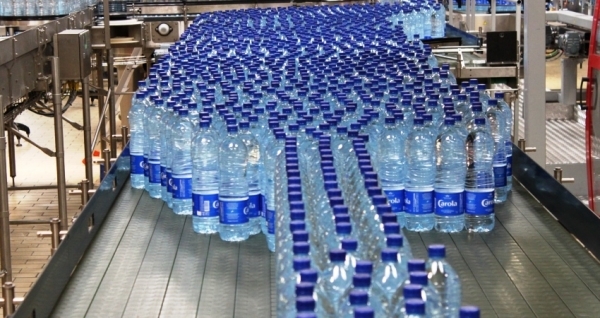 Thanks to plug-in connections, the injection system can be completely removed from the main system to enable cleaning and conversion to other fillings. Once the croissants have been filled, F2 robots place them in groups of twelve on the belt. 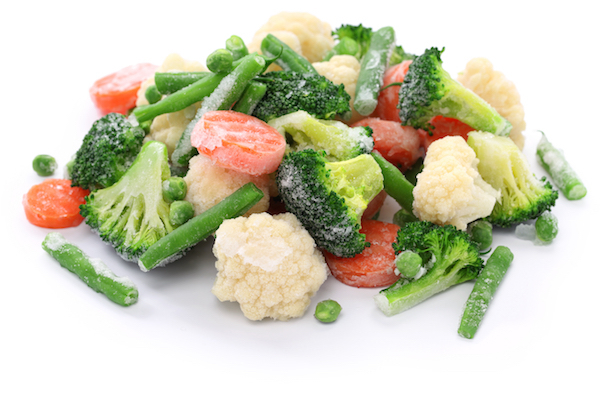 Then they go through a froster. In the final step, the deep-frozen products are packed in flow-wrap bags either individually, in packs of three, or in cartons at the next Schubert system. Thanks to this automation solution, San Giorgio Dolce & Salato can fill and package 160 croissants per minute. This efficient combination of injection and final packaging process is of great benefit to the Italian company, as is the flexibility that enables different baked goods to be filled and packaged in the same system and/or in the same manner. San Giorgio Dolce & Salato is therefore able to expand its range of pre-baked pastries as needed. 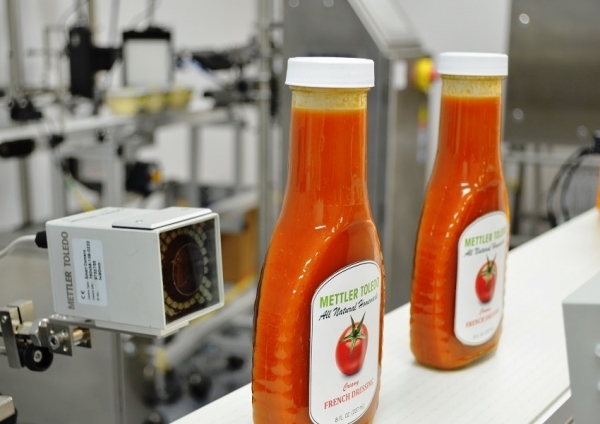 This example clearly shows that state-of-the-art production and packaging facilities are a key success factor for the further growth of the family business.